It's a conversation Nicole Kupaks finds herself having every so often. It starts with people asking what she does for a living. Her response sometimes leads to even more questions. After all, people aren't used to meeting the only female president/general manager in hockey. That's something she's trying to change. "It's not easy for a female, especially in this role, even if it's in the minors. There's not many of us out here. Hopefully I've proven a lot in my work ethic and the quality of product that I put out there," said Kupaks, who was named GM of the CHL's Laredo Bucks in 2011 before the team was moved to St. Charles, Mo., last summer and she inherited the additional title of team president. "[People ask,] 'Do you coach your son's team?' No, I run the minor pro team that we just brought into town. "They kind of do a triple take and ask, 'You?'" Yes, her. And no, her dad doesn't own the team. She's just a determined woman from Austin, Texas who fell so deeply in love with hockey that she attended a 2004 Central Hockey League jobs fair in Dallas. After being offered seven jobs, Kupaks left a lucrative position with Dell Computers to become the Bucks' director of public relations. Her first day in Laredo, the team won the 2004 CHL title with a Game 7 victory over the Bossier-Shreveport Mudbugs. From the beginning, it was clear Kupaks was living her dream. Within four years, she was promoted to vice president of business operations before spending two years away from the club working as a director at the Artic Wolf Ice Center in College Station, Texas. 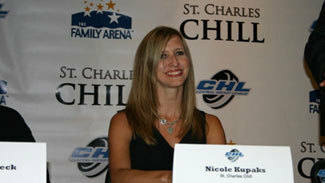 Laredo's owner eventually lured Kupaks back to the Bucks, who in June 2011 named her one of the only female general managers in hockey history. In addition to Kupaks, Kristin Ropp is vice president and general manager of the Cincinnati Cyclones in the ECHL, and Tera Black serves as chief operating officer and alternate governor of the Charlotte Checkers in the American Hockey League. They follow Maribel Castillo, who was in 2006 was hired as general manager of the CHL's Corpus Chirsti IceRays, making her the only female and Hispanic executive in the league. The precedent was primarily set in minor league baseball by Marla Terranova Vickers of the Montgomery Biscuits and Liz Kern of the Wisconsin Rapids Rafters. There's also Kim Ng, a Major League Baseball executive who made history in 2005 when she was interviewed to become general manager Los Angeles Dodgers. In St. Charles, Kupaks is tasked with building the Chill's identity in Missouri. After posting a losing record last season, the Bucks ceased operations, transferred their franchise rights and renamed the team. She is trying to make inroads in the St. Louis suburb, turning the Chill into a part of the community before building up the team's on-ice product for a return in 2013-14. "We wanted to come in a year before dropping the puck and really become a fabric of the community. We don't just want [locals] to be our customers or fans at our games. We want to be a part of the community and really get as involved as possible," Kupaks said. "I was looking in this market and was really entranced by the area. I knew it was a great place to raise my son. I am a single mom, so that was really important to me. Being in a traditional [hockey] market for the first time in my hockey career was amazing." The process of building the Chill started in earnest this week with the hiring of former St. Louis Blues defenseman Jamie Rivers as the team's coach. Kupaks still has of plenty of work to do before the Chill's first game next season, so her prime motivation isn't necessarily inspiring young women all over the sports world. But she's managing to do that regardless. "Just because it hasn't been done before doesn't means it can't or shouldn't," Kupaks said. "Moms come up to me and say, 'Do you realize my little girl keeps saying she can do this because you did it?' That's more rewarding than any title that I could have been given."